It seems to have taken Forever to arrive, but the SMART Forfour is finally here. And, as predicted, it’s already got the public pointing. 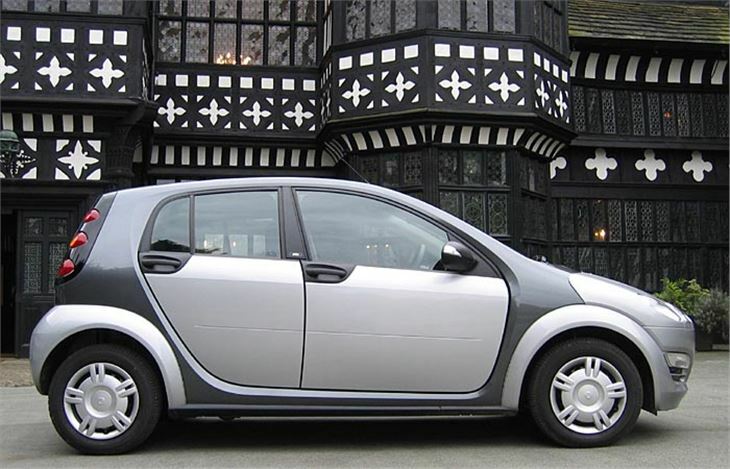 The original SMART City Coupe and the Smart Roadster turned heads. The Forfour does too. And the expressions on people’s faces say they want one. 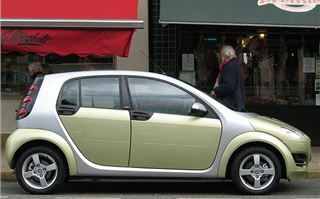 Most couldn’t manage with a two-seater City Coupe (now, appropriately called the ‘Fortwo’). 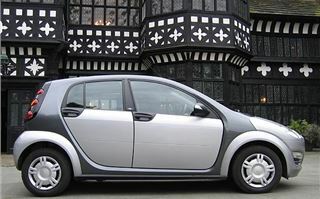 Most couldn’t justify spending upwards of £11,995 on a cute but tiny two-seater SMART roadster, however much they wanted one. 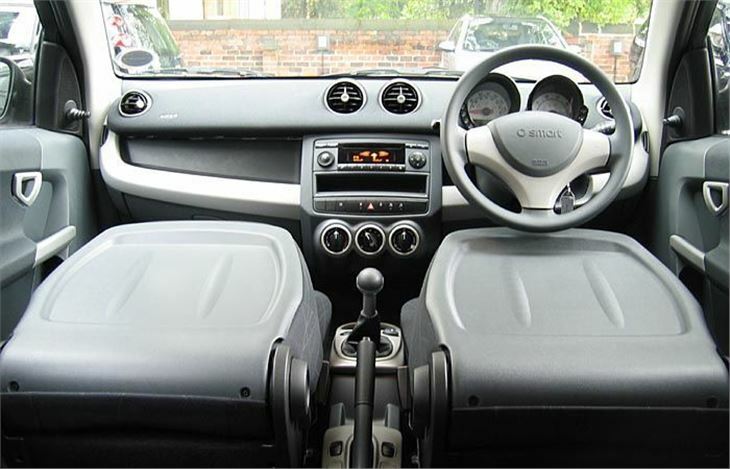 But they can start to think very seriously about a full four to five-seater hatchback that starts at £7,995. That buys the 1.1 litre ‘Black’, a special launch model to welcome buyers with a bargain. And it is. You get the same floorpan, same engine and same gearbox as the new Mitsubishi Colt. And what you sacrifice in headroom you get back with the funkiest four-seater hatchback you can buy. It doesn’t lack much either, as an entry-level model. You get four-wheel disc brakes with ABS with Brake Assist, Electronic Brakeforce Distribution and Acceleration Skid Control. 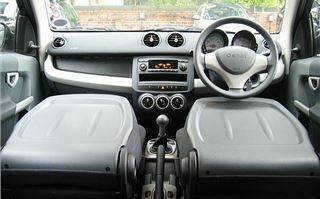 There’s power steering, electric front windows, a radio/CD player, a sliding, folding rear seat with a 60/40 split backrest (though unlike the Colt’s it doesn’t remove). There are oddment spaces for just about everything you could chuck at them. The coloured plastic panels are all deformable, so shrug off minor bumps. And, don’t believe first driving reports, as long as you go for a manual, the car drives very well. At first, the steering of the 1.1 felt a bit sticky and dead compared to the featherlight Colt. 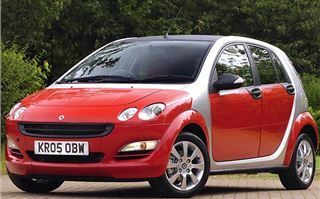 But I soon get used to it and found I could push the Forfour a lot harder on corners. It doesn’t shout ‘fun’ like a MINI, but it can still run rings around most of the cars in its class, including the Fiesta, 206, Polo and Jazz. The car has the same gutsy 75PS three-cylinder engine as the Colt, which doesn’t make it a sportscar by any means, but it’s enough. And because SMART specifies different springs and suspension bushings for the Forfour, it handles better than the Colt, with no tail wagging at speed. That’s the base model. If you have more money to spend, forget the other 1.1s and even the 1.3s. Go for one of the diesels. The twin-chain-cam three-cylinder 1.5 litre common-rail direct injected engine sets a new standard for small diesels. It comes in two outputs: 68PS and 95PS, a £1,000 price hike achieved simply by reprogramming the ECU because the engines are otherwise the same. The 68PS Forfour diesel grips better at the front than the 1.1 and, with a lot more torque, feels much punchier out of corners and roundabouts. It’s still not quite as much fun as a MINI, but enjoyable and nippy enough to match the Forfour’s cheeky looks. The more powerful 95PS felt sporty the first few metres I drove it. The steering was much more positive and I could feel the front tyres clawing the road surface. The one I drove was the cheapest £10,995 Pulse spec on standard 14” steel wheels with 175/65 R14 tyres. Yet it was a hoot. Quick and grippy when I wanted it to be. Docile when I didn’t. Maybe it is yet another case of standard wheels and tyres feeling much better than the marketing men’s big alloys with wide ultra low profile rubber. I spent a couple of hours revisiting Cheadle Hulme where I lived as a nipper and hadn’t seen for nearly 40 years. Trying to retrace the walk to and from school after 40 years of town planning meant a lot of stops and starts, and the Forfour didn’t object at all. In fact the Forfour received its first compliment parked at the front of the school, from a mum picking up her son with a Jeep Cherokee. She not only noticed it, she was keen enough to tell me she thought it was a really nice car. I could write endlessly about the trim combinations, the long as your arm option list, the interchangeable coloured plastic panels that allow you to change your car without changing your car. But you’ll find all that in the detail below. Just a few last things: Go for the phone kit that turns your car into a phone because it uses a plug-in cradle adaptor for your existing phone rather than Bluetooth. Swap your phone and you swap the adaptor. This makes the car friendlier to more phones than the sometimes incompatible Bluetooth kits. 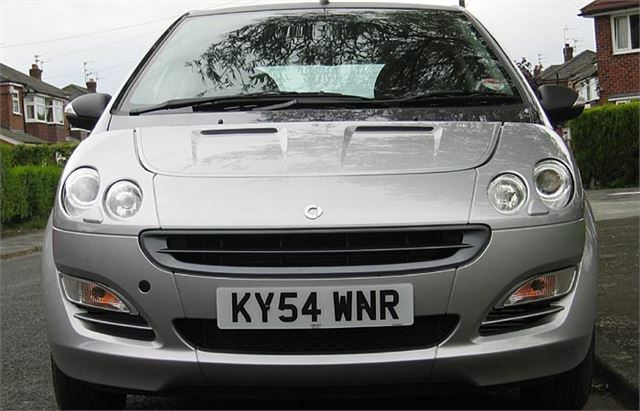 A mere £80 buys you a third lap and diagonal rear belt and headrest, turning the Forfour into a Forfive. If 109PS isn’t enough for you, at sometime next year there will be a 180PS Forfour Brabus. And if you fancy a 75PS £7,995 Black, grab one soon. Next year it gets replaced with a 66PS Pure model with less kit for the same money. Finally, someone’s bound to ask, so I’ll anticipate the question. If I had the choice between a SMART Forfour and a MINI Cooper for the same money, which would I go for? 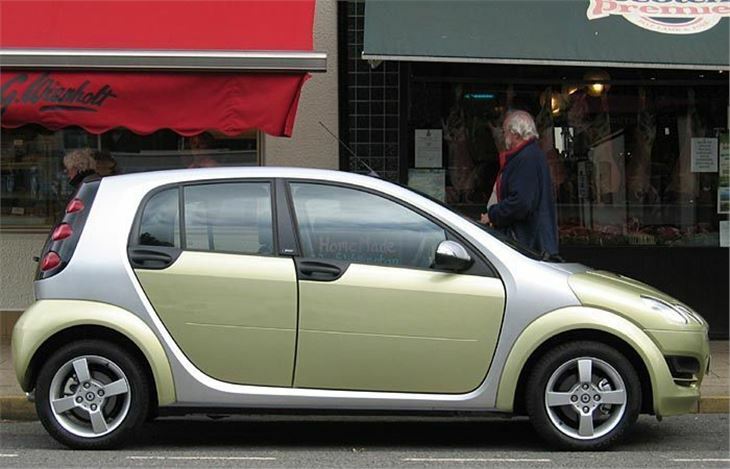 It would have to be the SMART Forfour 95PS CDI Passion in Silver Tridion with the melon green metallic panels like the car pictured in front of the shops. Until I changed my mind about the colour. 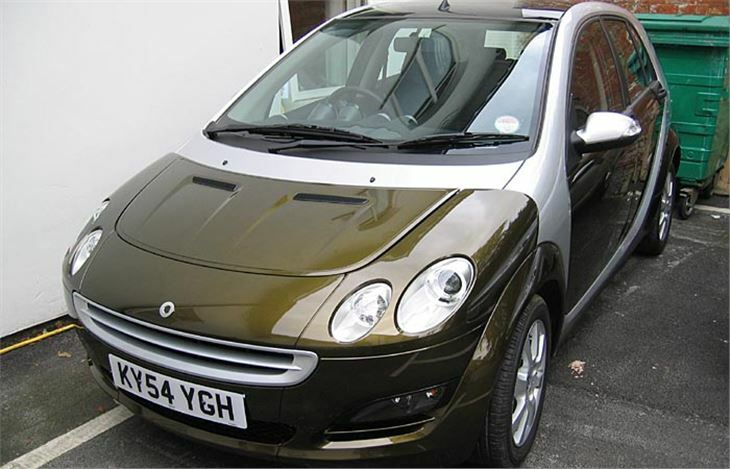 Update 23-1-2005: A week in a 95PS CDI Passion confirmed my choice. I did about 500 miles and averaged around 45mpg. Gearing in 5th gives about 28mph per 1,000 rpm, which is about right. It's a bit noisy, but not excessively so and the radio volume automatically rises to compensate. Handling and grip on 195/50 R15s was very good, eveh quite sporty. The diesels definitely handle better than the petrol cars.